Golfers paradise! Be the first to enjoy the Florida lifestyle in this brand new, two bed/two bath plus den condo in the exclusive gated golfing community of Riverstrand. 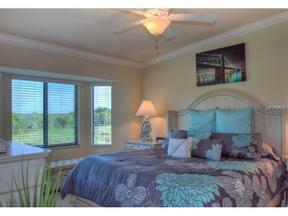 This condo sits right on the golf course and also has a view of the water. Relax in style and watch TV on the 60" flat screen from the plush comfort of your king sized bed! The second bedroom also has a large flat screen TV and plush new bedding. The den has a full size leather sleeper sofa and can be used as a third bedroom. The living/dining area is a spacious open plan that allows for entertaining, comfort and privacy. The Kitchen features granite countertops and stainless appliances. Everything new! With two screened lanais, there is also room for entertaining outside and taking in the golfing action out on the course. Off street driveway parking. This unit also offers a membership transfer that will allow you to golf on this private course and also use all of the amenities this desirable community has to offer. have some fun in the warm Florida sun this season!